This summer, the Voice will be highlighting the work of community volunteers. To nominate someone for a profile, email voice@spokesman.com. Hundreds of local volunteer opportunities can be found at VolunteerSpokane.org. Spokane County United Way at 920 N. Washington St. is looking to fill six AmeriCorps VISTA positions. Rhea Turner has a bachelor’s degree and makes $973 a month. And she’s doing the job she wants to do. Turner, a 24-year-old Ohio transplant living in Spokane, works in a branch of AmeriCorps aimed at fighting poverty. Her small living stipend comes in return for busy weeks spent organizing with local nonprofits. She’s the one responsible for VolunteerSpokane.org, a website that displays hundreds of volunteering opportunities in and around the city. Any registered nonprofit can post “needs” on the site – like murals that need to be relocated, or food that needs to be plated – and interested volunteers can respond. 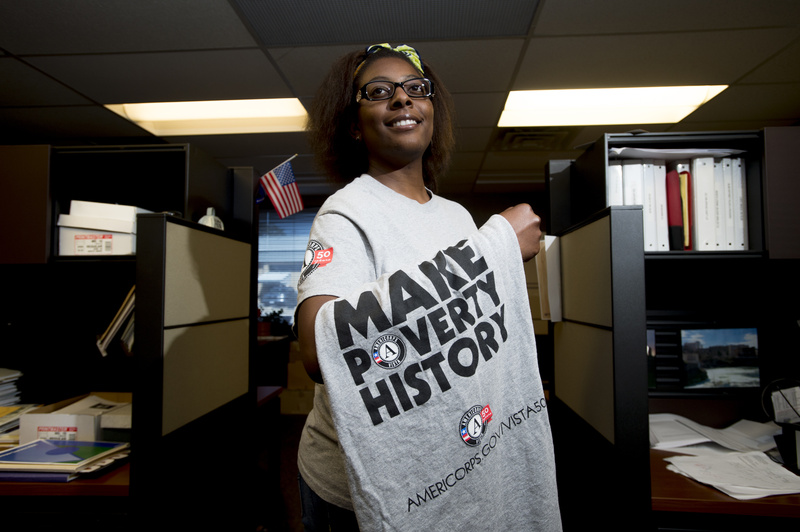 Turner is a member of AmeriCorps’ VISTA program, which stands for Volunteers In Service To America. The program brought her to Spokane County United Way in November 2014 after her husband was stationed at Fairchild Air Force Base. Her work on the website, which launched about two years ago, brings local nonprofits together and attracts many helping hands. Turner also was instrumental in planning the second annual Spokane Gives Week in April, a project for which Mayor David Condon gave her the city’s Individual Compassion Award. The event garnered more than 10,000 volunteers who worked a combined 50,000 hours, packaged nearly 108,000 pounds of food and planted more than 2,300 seedlings in public parks, according to the city. Before shifting her focus to social work, Turner’s passion was film. As a communications student at the University of Akron in Ohio, she was president of the university’s film club and managed promotions for the radio station. “I always wanted to be a producer,” she said. Turner became interested in nonprofits while working with minority students and students from poor families. She said the number of students in the university’s Upward Bound program had fallen dramatically in recent years. “That really opened my eyes to there’s organizations that really need help,” she said. Turner, who is black and was raised in Canton, Ohio, said she believes minority students often lack information that’s needed to prepare for college. After her term in the VISTA program ends, she plans to get a master’s degree and become a college counselor. In 2013, Turner, the eldest of three siblings, became the first member of her family to graduate from college. Her sister and mother then followed in her footsteps.